Instagram is a wonderful place for art. We bought our artwork from an incredible artist called Beeple_crap. We contacted him and asked him if we could buy the rights of using these photos for our singles and album. After much consideration we found 5 pieces that really suited our music perfectly. It is really not cheap to be a musician these days, and our budget was not something to brag about. We payed a one time fee for using his art, and did not think much more of it. 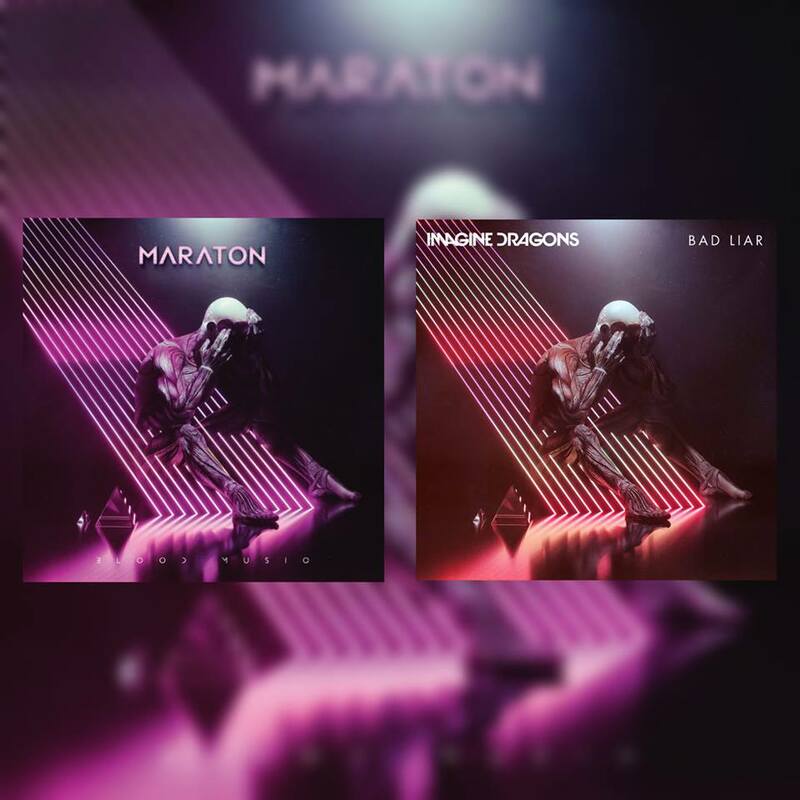 Suddenly we saw that Imagine dragons had a new single coming up with the same artwork, 6 months after our release. With no deal in hand giving us the exclusive rights for the photos, we can only say one thing. DAMN – They got good taste!! MARATON pushes the boundaries between pop music and progressive rock, mixing machine like drums and roaring bass groundwork with shimmering guitars, ethereal keys and sacral vocal performance. The band has sought to create a style of music which combines the rhythmic heaviness from bands such as Mars Volta with the pop aesthetics of Muse. In 2014 a dream and a journey towards a record emerged from the guys of Maraton. They had a vision to make an album that was uncompromising and groovy with hook`s that would make you sing along after the first listen. By digging into Simen Ruud`s (Maraton’s songwriter) creative foundation they pulled out sketches and ideas that could have potential of becoming record material. After several months of productive creation, Maraton could finally see a shape of what to come. During this year, the only thing that mattered for the guys was making music and lyrics that in the end could merge into “META”. One of the criteria and dream of the band was to only work with the best and qualified professionals in Norway when it came to studio, mixing and mastering. On this list are amongst others the incredibly talented Henning Svoren, at Ocean Sound Recordings. During the recordings of the album, the band spend a lot of time on every instrument. They were constantly reaching for the perfect Maraton-sound. It was also extremely important that each song had a meaning and that the final album had a red line in which all the tracks could be connected. When writing the lyrics and the melodies, Simen’s magnificent writing and melodic skills were combined with Fredrik’s passion to convey. With this perfect match they were able to create a story and nerve behind each song. The theme on the album is mainly human mentality; individual and personal reflections of this crazy world. One can say that the theme is psychology. During this process from 2014 until today, 2 of the members left and three new have entered. Maraton today is a strong team with good companionship full of passion and ambitions for the band and its sound. This album has brought laughter, tears and hundreds of hours of work. “META” has been a journey that Maraton can be proud of and stand behind the rest of their life. And now, after a year with 5 single releases and great feedback, the album is finally set for release on April 24 th, 2019!